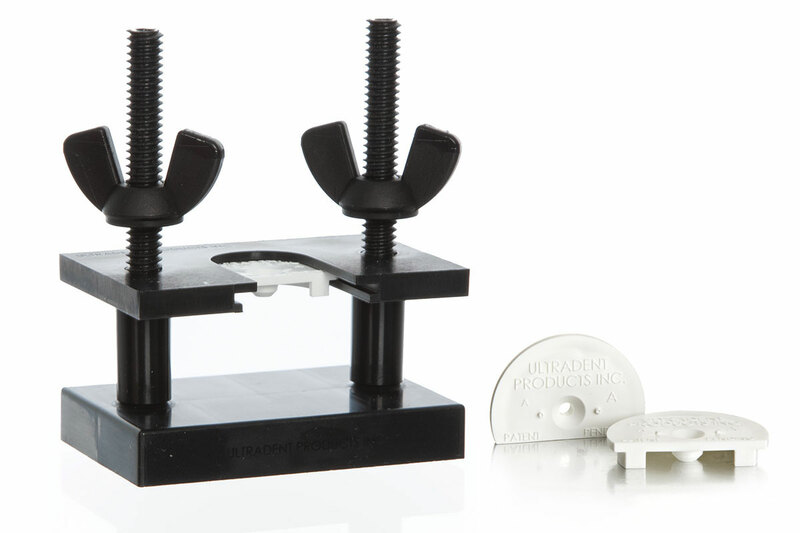 UltraTester™ Bond Strength Testing Machine - Products - Category - Ultradent Products, Inc. 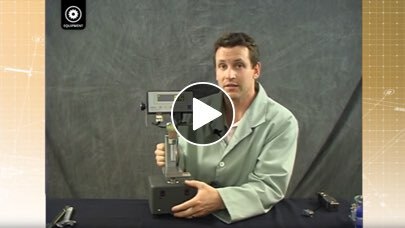 The Ultradent UltraTester machine is a compact, highly rigid testing machine specifically designed for capturing peak load values in compression tests with ranges from 0–1,000 pounds. It can be programmed for test speeds ranging from 0.1–15 mm/minute and can be set with default time limits and load limits as needed. Weighing only 15 pounds, the UltraTester machine is highly portable and is simple to use without extensive set up time or education to get started. Unlike any other single-column testing machine, the UltraTester machine is extremely rigid, allowing it to hold its loading forces in a highly linear motion. This prevents loads from shifting or transferring during a test and also provides accurate, easily repeatable compression test results. The load cell, which senses the applied force, was chosen due to its ability to tolerate transverse or cross loading with little negative effect. The UltraTester machine captures the peak value directly on the machine, making it ideal for training situations and student education. 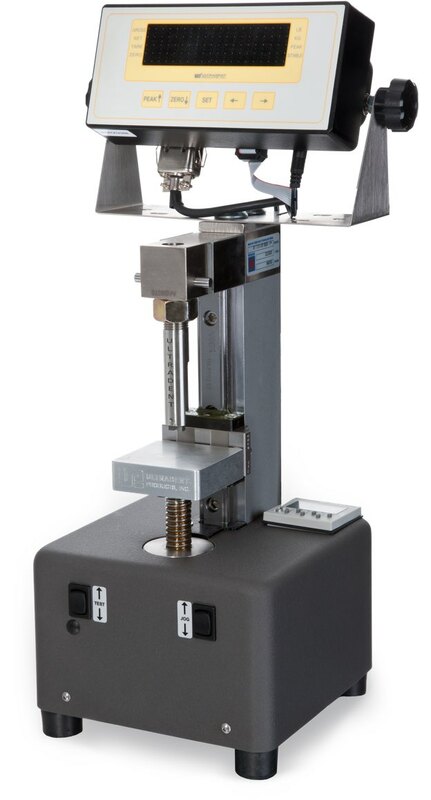 When used with the Ultradent Shear Bond Test Methods and specimen-preparation techniques, the UltraTester machine can be used to collect data rapidly to facilitate improved understanding of dental materials. 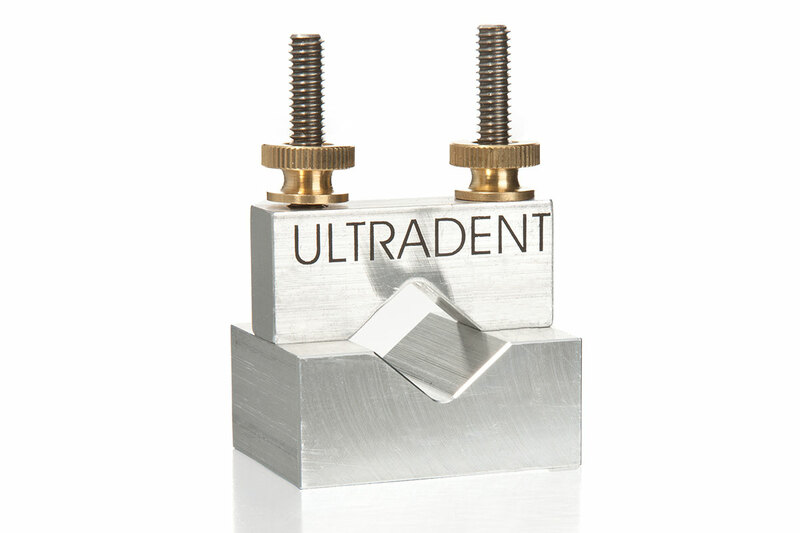 The UltraTester machine is designed to be used with the Ultradent Shear Bond Test Method. 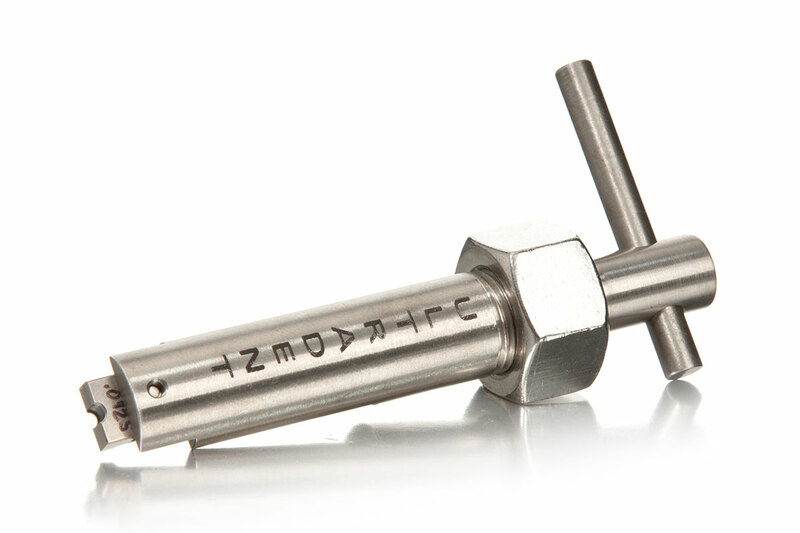 This method uses a mold and clamp to create consistent cylindrical specimens that can be tested with the notched crosshead provided. 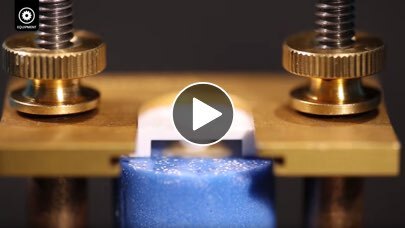 The notched crosshead fits the composite adherend perfectly, allowing for the most uniform stress distribution across the bonded interface to achieve test results that closely approximate adhesive shear strength, rather than peel strength produced using a straight contact. The notched crosshead’s unique geometry allows only a small portion of the crosshead to contact the adherend, which minimizes difficulty in positioning the crosshead directly above the bonded surface. The UltraTester machine is intended for research purposes only. Max Distances Between Load Cell and Test Platen 5 in. Platen Dimensions 2 in. x 2 in. x 5/8 in. The bonding clamps are able to function for years with normal use. The mold inserts are made of injection-molded polypropylene, which allows for a highly polished and uniform internal surface, so the composite can polymerize without substantial adhesion. The molds are semidisposable and will generally last between 50–100 uses. The mold has been designed so that only a 0.1 mm rim touches the tooth, allowing for quality isolation of the bond site to be achieved. The test base clamp holds the prepared specimen in place on the UltraTester machine during testing. The crosshead assembly will fit most Instron testing machines and utilizes a 12 mm diameter coupling which can be inserted into a testing machine, pinned, and secured with a locking nut. The crosshead centers the loading forces through the center of the crosshead to allow for precise linear motion to be achieved. 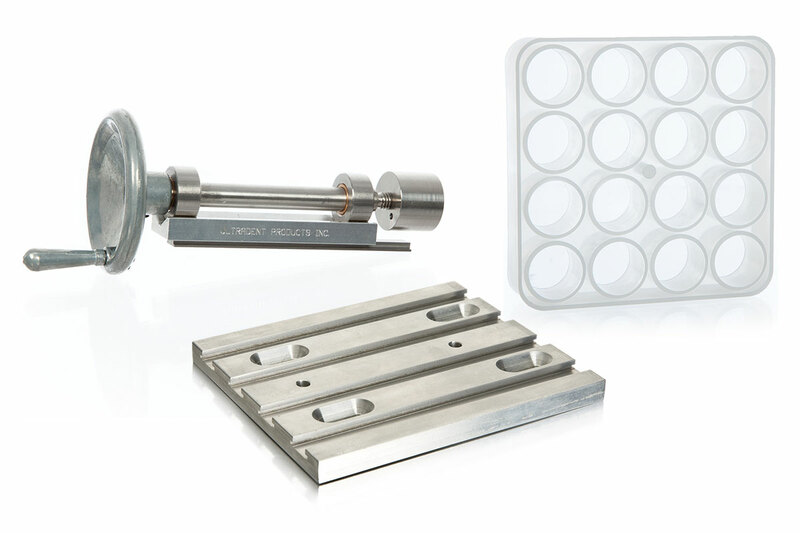 The grinding assembly kit includes five 16-hole molds for casting methacrylate cylinders to embed teeth or other dental substrates. The mold produces cylinders measuring 1 inch in diameter by 1 inch in length. The cylinders are then ground to produce parallel surfaces and to remove any unwanted debris using the grinding mandrel. 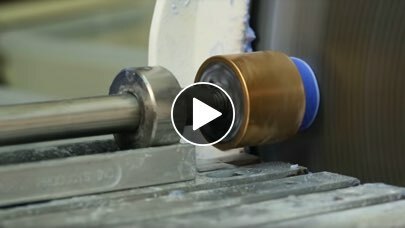 The grinding mandrel is designed to receive the 1 inch cylinder and allow the technician to press it against a model trimmer/grinder while rotating the cylincer to produce a random grinding pattern on the surfaces. The mandrel is held secure in a T-slot grinding plate, which is intended to be mounted to a model trimmer’s working table.